You were tattooed in a modern studio using only single-use and sterilized instruments. Complying with the following instructions will result in a quick healing process and an attractive tattoo. Remember: the life of your tattoo depends on the care it receives within the first few weeks. ALWAYS be sure to thoroughly wash your hands with warm water and antibacterial soap before touching your new tattoo. Contact with dirty hands is a major contributor of infection. 30 minutes after your tattoo is finished, remove the bandage your tattoo artist put over your new tattoo. Wash your tattoo thoroughly with antibacterial soap and warm water. Be sure to rinse away any & all secretions and be sure that all soap residues are rinsed off. Lightly pat dry your tattoo with a clean paper towel. After washing your new tattoo, apply a small amount of Gold Bond Ultimate Soothing Fragrant Free lotion and massage it into your tattoo. DO NOT apply a thick coat as your skin must be able to breathe. Your new tattoo will develop a layer of dry skin. DO NOT PICK this off. Wash and apply lotion three times daily until the layer falls of on its own. After the dry skin has fallen off, there will be a period of adjustment for the new skin. It is advisable to use a skin lotion during this time, which is usually two weeks. Depending on the nature and extent of your tattoo, it may be necessary to wear clothing heavy enough to protect it, particularly if you work around grease, oil, dirt, metal, etc. Be sure that any clothing that touches your tattoo is soft and clean. DO NOT rub, scratch, or pick at your new tattoo. DO NOT use A&D Ointment, Neosporin, Vaseline, or petroleum jelly. Avoid fragrant and specialty lotions (like “skin firming”, “bronzing”, or “age defying”). DO NOT expose your new tattoo to sunlight (natural or artificial) at all for the first month. After that, always apply SPF 35 or higher sunscreen before going outdoors. Do not shave over the tattoo for at least a month. DO NOT submerge tattoo in water for 3 weeks. This includes baths, swimming and saunas. Saltwater and chlorine will ruin your tattoo and too much water exposure can cause wrinkling and puckering of skin which can also damage your new tattoo. If you are on antibiotics, do not get tattooed! If you have to take antibiotics during the first month of getting a tattoo, it could possibly cause your tattoo to fade. 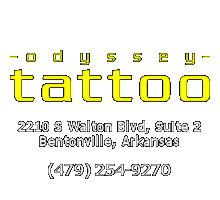 Your tattoo might produce small amounts of blood and plasma for 24 to 48 hours especially on tattoos that have a lot of color or tribal. Make sure to wash this off 3 or 4 times a day and apply lotion after washing. The healing process usually takes between 2-3 weeks, but can vary from person to person. Wear old, but clean clothing over tattoo when going to bed to avoid leaking plasma on sheets. This will also prevent your tattoo from becoming stuck to the sheets. If your tattoo sticks to your clothes, dampen with warm water to loosen. DO NOT yank it off! Your tattoo might peel in 4 to 5 days. It will flake like a mild sunburn and there will be pigment in the skin that peels off. You might have some soreness and swelling for anywhere from 3 to 5 days. Tattoos on the hands and feet might peel twice. After the first time it peels, you will have a whitish film over the tattoo. This will peel off in a few days. Remember, we do not guarantee tattoos on hands and feet, so take care of them to lessen the chances of requiring a touch-up! When your tattoo is healed, you might notice a spot here or there that needs to be touched-up. If so, let the tattoo heal completely for at least six weeks before scheduling a touch-up with your tattoo artist. After it is healed, dry skin will cause the tattoo to look dull. To brighten the colors up, use lotion daily. To extend the life and brightness of your tattoo, always apply SPF 35 or higher sunscreen over your tattoo before going outdoors. Once you leave the studio, the tattoo is your responsibility. If you have any problems or questions, please give us a call at 479-254-9270.